While travelling from new delhi railway station to Howrah, after the overwhelming performance of our play 'Ashwatthama-the war machine' at LTG, in 19BRM, by poorva exp(train no 12382) coach no A1 and A2, our and our copassenger's luggages and bags, worth rupees 5lakh almost, have been stolen between the station Kanpur and Mughalsarai. The thieves used cutter to cut the chains, we used to bind our luggages. I sent a sms to Suresh Prabhu stating him the incident. But no reply came. My co-passenger Arpita Roy also has lost her camera, tripods, lenses n all her shooting equipments. She is also travelling from New Delhi to Howrah. 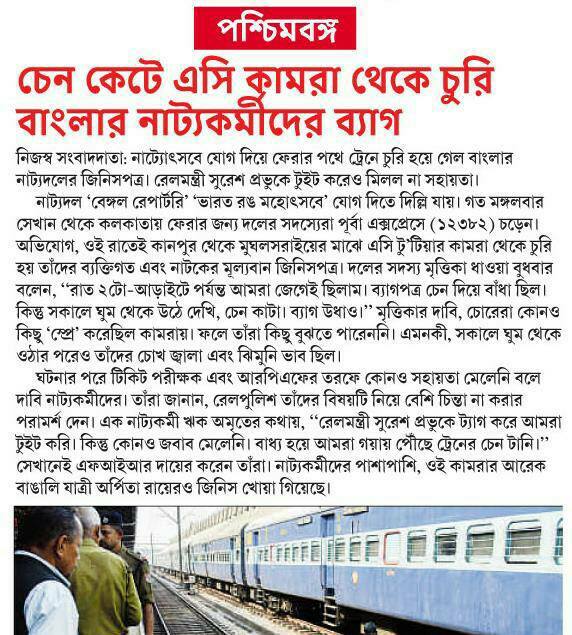 There was no TTE, neither any Guard or even the Coach attender was not present. They came almost 2 hours later, we found the incident happened. When we asked the RPF for help they were very much ignorant. They were saying that 'ye to hamesha hota hi hai, saman milega nahi, aap bas formalities puri kardo'. 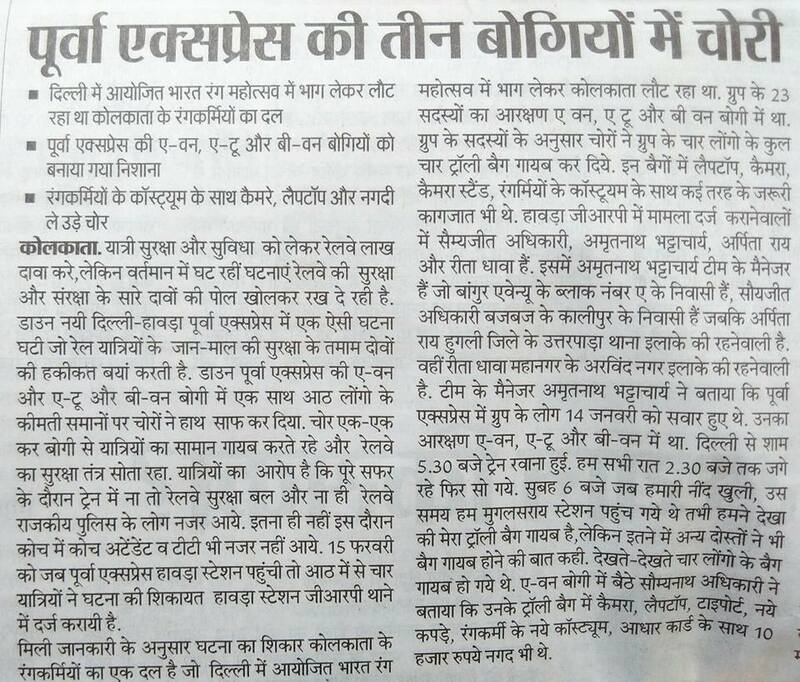 We asked the RPF to call the Train Superintendent, they just ignored the fact stating that 'itna serious kiu ho rahe ho'. 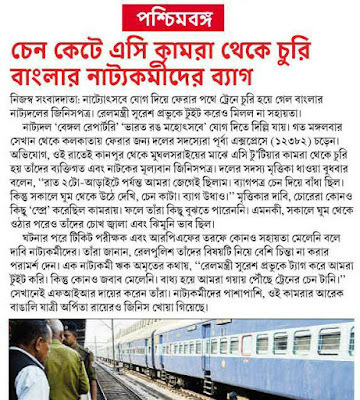 After started shouting they give us the complaint book to write down the complain, and then at Gaya we pull the chain, made the train stop for an hour, the RPF came, lodged the FIR. But is this the procedure? 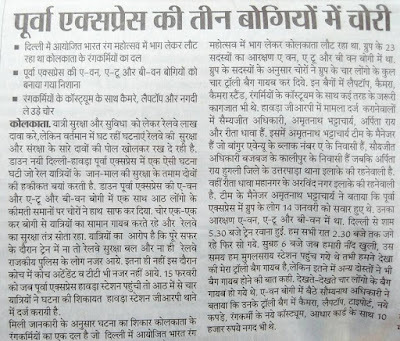 I still don't know if any action has been taken yet or not, but I am afraid of the situation, and the system, security and the managent of Indian Railways. They just cant provide the basic security to their passengers, I don't know what will happen, but I am frightened. My team is frightened. I don't know what will hapen next. Is this a got up?